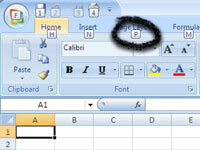 In Microsoft Office Excel 2007, you can select commands on the Ribbon by using keyboard shortcuts. Press the Alt key followed by letter keys displayed on the Ribbon to select the desired Excel command without taking your hands off the keyboard. 1Place the cell cursor in the proper location (if applicable). 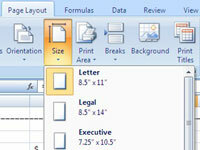 For example, if you want to use the keyboard to apply formatting to specific cells, select those cells. 2Press Alt on the keyboard. Shortcut letters and numbers appear on the Ribbon. 3Press a letter to select a tab on the Ribbon. For example, press P to select the Page Layout tab. 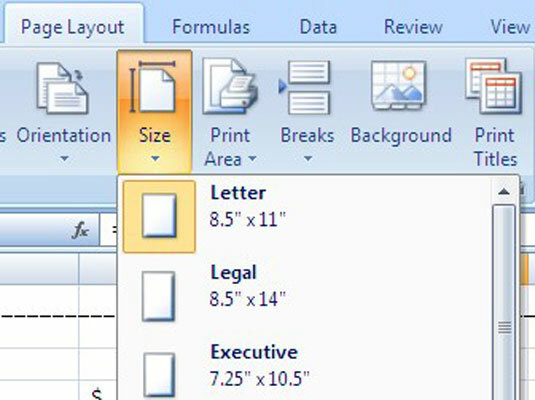 Excel displays the tab and letters for each command on that tab. 4Press a letter or letters to select a command. Excel displays options for the command you selected. If you pressed the wrong key(s), you can press Esc to go back one step at a time. 5Press a letter or use the arrow keys on the keyboard to select an option. Excel performs the command you selected, applying the option you chose.